Can I be a bit annoying for a moment? Hello everyone. I’m not too good with these “call to action” request. 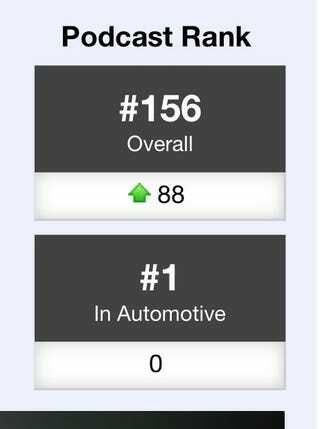 So please forgive me right now The Untitled Car Show is sitting at #156 over all on podomatic, #45 on the iTunes automotive chart and #1 on podomatic’s automotive chart. I have never broken into double digits on Podomatic’s overall chart, and haven’t broken into the top ten on iTunes either. While making it Close a few times i would love to break into them today. How can you help? You can listen to the latest episodes, or send them to a friend you think may enjoy them. Are you all caught up with the show? Maybe give a old episode a listen? Don’t have a podcast app? You can always listen in your browser. I feel somewhat selfish appealing to y’all to do this. I don’t want to lie to y’all about my motivations and intentions so I’m trying to be direct and to the point because I think that’s what you have come to expect from show. Hitting these goals would be a boon for the show, it could help me get better guest for the show, maybe help pull in some more interest from advertisers. So please If you can give it a listen, share with a friend whatever you’re willing to do.